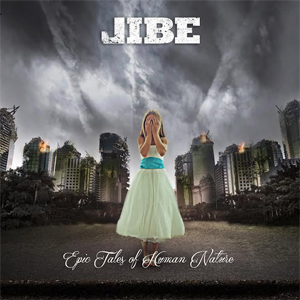 Legendary Dallas, Texas Rock band JIBE has released the Official Music Video for "We've Only Just Begun", which originally premiered on Tattoo.com, the second single off of their upcoming album, Epic Tales Of Human Nature. Due out June 9th, Epic Tales Of Human Nature was produced by Matt Noveskey (BLUE OCTOBER), and mixed by Grammy award-winning producer/engineer Toby Wright (METALLICA, ALICE IN CHAINS, KORN). Watch the video now on KNAC.COM HERE. JIBE began in late 1993 after friends Joe Grah and Toby Bittenbender met bassist Sean Robinson while working at Guitar Center in Dallas, Texas. Drummer Ben Jeffries joined the other members upon moving to Dallas in February 1994. JIBE played their first show at a club called The Basement in Dallas in April 1994. The group soon became known for their energetic and intense live shows and relentless touring schedule, playing well over a thousand concerts in their first five years. JIBE released their first album, a live concert recorded at Trees in Dallas, in 1994. The self-titled LP Jibe followed in 1996. The band received their first taste of success in 2000 with their single "I’ll Meet You Halfway" from their second studio album In My Head, which reached the #1 spot on college radio stations in Texas and Louisiana. Although compared by the press to classic rock acts such as JAMES GANG and LED ZEPPELIN, the band cited contemporaries such as U2, PEARL JAM, and JANE'S ADDICTION as the primary influences on their developing sound. In 2003 Jibe released their third album, Uprising. The single "Yesterday’s Gone" received significant national airplay and spent nine weeks in the top 30 on the national rock chart, peaking at #26. The song soared to #1 at radio stations in Dallas, Austin, and Shreveport, and reached the top 10 at dozens of stations across Texas, Oklahoma, and Louisiana and made the top 20 in several other markets nationwide. "Yesterday’s Gone" charted at #71 on Radio & Records year-end list of the top 100 rock tracks of 2003 and was chosen by the Dallas Cowboys as the music bed for their 2003 season. Uprising was also a critical success, earning awards for alternative album of the year, male vocalist of the year, producer of the year, and song of the year at the 2003 KEGL local show awards. JIBE quickly found themselves in high demand as an opening act for popular nationally touring post-grunge rock acts of the day such as CREED, STAIND, SEVENDUST, SHINEDOWN, SEETHER, SALIVA, OURS, OLEANDER, LIT, and OUR LADY PEACE. JIBE toured with NICKELBACK, JERRY CANTRELL, JOSH TODD, KINGS OF LEON, and MARILYN MANSON and established themselves as one of the premier rock bands in the Dallas scene. After playing over 2,500 concerts, JIBE suddenly broke up in June 2004, much to the dismay of their fans. According to the Dallas Observer, the band seemed to be “perpetually perched on fame’s doorstep” and after the success of their most recent album, by all accounts were “on their way up”. According to JIBE frontman Joe Grah, one night he simply got in his car and drove to Los Angeles and didn’t tell anyone for three days. During his time in JIBE, Grah had become addicted to drugs and alcohol and believes that if he hadn’t left Dallas and broken up the band, he probably would have died. JIBE’s reputation in the Dallas scene has become legendary. The legacy of the band is inextricably tied to the pinnacle of the Deep Ellum music scene of the 1990s. Along with other prominent Dallas bands such as TRIPPING DAISY, THE TOADIES, DROWNING POOL, and REVEREND HORTON HEAT, JIBE are revered as standard-bearers of a bygone era when rock fans packed the clubs of Deep Ellum. JIBE played their first concert in eleven years on September 25, 2015 at Gas Monkey Live in Dallas. The show was free, but required tickets which could be reserved at Dallas rock radio station KDGE’s website. The tickets sold out in less than ten hours, and the concert was moved to a larger venue, where tickets again sold out. As of early 2016 the band has written an album’s worth of new songs which they are recording at Orb Studios in Austin with producer Matt Noveskey. They are also working on a documentary film about the band's history and reunion.